Well, here we are at last. 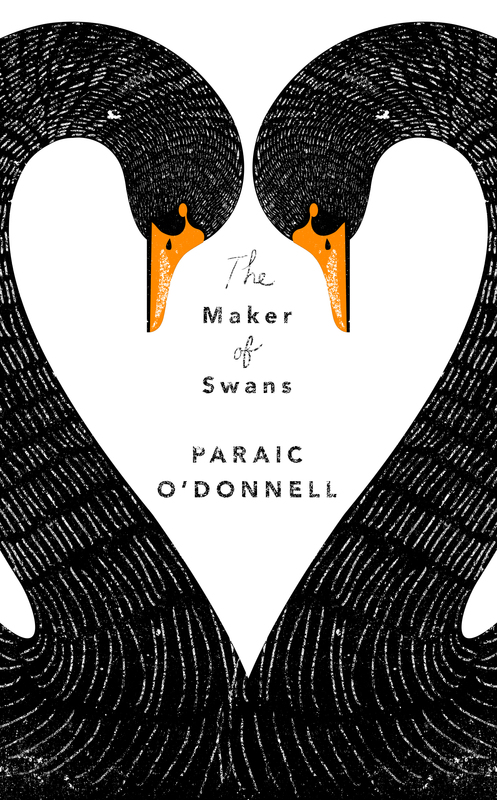 The Maker of Swans officially has a cover. Not that it’s been the best-kept of secrets, mind you. Early proof copies of the book began circulating a few weeks ago, and images of the preliminary cover began to surface on Twitter shortly afterwards. Last week, though, the finished artwork was uploaded to the databases of the online retailers, which is the nearest thing a cover gets these days to an official unveiling. And what a cover. Authors are supposed to say this sort of thing, I know, but I have loved it without reservation from the moment I first saw it. Back in June, when my editor sent me an early JPEG version, my response was less eloquent than I might have hoped. I had replied to her email within three minutes, but I’d only spent ten seconds or so typing. The rest of that time was spent staring in rapture. And it is glorious. I can say that freely, having had nothing to do with it. The team at W&N have produced a design of singular grace and immense subtlety, and one that encapsulates the book with almost miraculous economy. I’ve paid tribute to them in private, of course (effusively, and at embarrassing length), but I was determined to give them the wider acknowledgement they deserve when the time came. I was thrilled, then, when the design team agreed to be interviewed, to discuss not just this particular book but their approach to cover design in general; the extent to which it is constrained by conventions or shaped by trends, and the balancing of creative and commercial impulses. Steve Marking is Art Director at Orion Books. He is a graduate of Central Saint Martins, and in his role at Orion, he oversees the design of covers for its W&N imprint. He has worked on covers for authors including Gillian Flynn, Laura Barnett and Henry Marsh. Sinem Erkas is a multidisciplinary designer and illustrator. Like Steve, she was trained at Central Saint Martins, and her portfolio includes book covers for Orion Books, Profile Books and Bloomsbury. You can see more of her work at http://www.sinemerkas.com/. What’s the single most important job that a book cover must do? Steve Marking: Get noticed. But that doesn’t necessarily mean shouting the loudest. There’s more to it than that, though, isn’t there? Contemporary book covers are sophisticated design artefacts, and most of them clearly operate on multiple levels. What else should a good cover do, aside from make someone pick up the book? SM: Give the reader enough information about the subject matter and style of the book, but leave some ambiguity to make the reader intrigued. Obviously, the amount of clear information versus intrigue depends on the type of book. And it should ultimately be a beautiful object that the reader will want to keep looking at, and will want to keep on their book shelf or coffee table. SE: I think after it grabs your attention, it then needs to keep your attention. Growth in e-book sales has begun to slow down, and there are whispers of nervous optimism in publishing about a resurgence in the importance of print. In the last couple of years especially, we’ve seen selected titles published in special hardcover editions, with features (laminated cases, sprayed edges, opulent endpapers, etc.) designed to make them more desirable as physical objects. Are you conscious of this trend? Do you welcome it, as designers? SM: I definitely welcome the idea of creating special editions, with tactile finishes, endpapers etc., of creating a beautiful physical object that’s as enjoyable to look at and hold as it is to read (well, almost). SE: Of course! It’s always exciting when we have budgets to do specials, but they should always add to the design rather than cover up a bad design or over-decorate it. So many covers have finishes just for the sake of it – I’m a believer in everything being there for a reason, not just for decoration. Non-fiction covers tend to be more literal and programmatic than those for fiction, though there are many honourable exceptions. Are fiction and non-fiction covers very different disciplines? Do you find one more liberating than the other? SM: With a non-fiction cover, you have to be a lot clearer about the book’s subject matter. Non-fiction can be easier to design than fiction, as you have something tangible to work with – a person, an event, a period in history. With fiction, particularly literary fiction, the cover needs to suggest a mood and emotion more than a subject, which is often harder to visualise. SE: I think with non-fiction it’s easier to sum the book up literally or with a witty image. Fiction, however, is a bit more complex. It’s more emotional, and this provides endless possibilities and directions. This can be seen when classics are repackaged in so many ways. Publishers invest a great deal in covers, and their design teams are constantly striving to create memorable and distinctive examples, some of which attract almost as much attention as the books themselves. Are you conscious of an ‘arms race’ to produce ever more striking and competitive designs? SM: I think the competition to create ever more interesting and innovative covers is very healthy. Book cover design right now is perhaps as creative as it has ever been. SE: Yes! I always try to make my next cover better than the last. And different! I don’t like being asked to do the same thing over and over. I always try to push my creative style, and not know myself what I’m going to do next. That’s what keeps it fresh. I tend not to look too much at other book cover designs or ‘the competition’ or ‘trends’ either, but look instead at other things for inspiration, like cinematography, art, illustration, text, found objects, etc. Book cover enthusiasts often remark on the way genre is signalled by conventions in cover design – moody photography with bold typography for crime; watercolours and cursive lettering for ‘women’s fiction’, etc. – do you sometimes find yourselves rebelling against these demarcations? SM: As a designer, you don’t want to just follow the herd, but you do need to tell the reader very quickly what kind of book it is. Conventions used in design are a visual language of codes, which can immediately tell a reader what kind of book it is. The trick is to make a book cover look like a crime novel, for example, but different enough from every other crime novel that it stands out and doesn’t blend into the background. The amount of ‘difference’ you can get away with depends on the genre, and on sales expectations. This is why some of the most innovative covers (and consequently the most copied), have been for books without the baggage of high expectations. Like A History of Tractors in Ukrainian, designed by Jon Gray, where the designer was free to come up with something different, and the publisher didn’t try to force it into a particular conventional look. SE: I think that’s where the fun is. Always trying to rebel against the genre look – that’s when covers really stand out! Why create something that will blend in? In some genres, it’s harder to break the mould. As a woman, I get asked a lot to design books for ‘women’s fiction’. They’re challenging, as the look generally is something quite whimsical and dated. I think literary covers are the best ones to work on because you can get away with more and the covers are more individual to the book, reflecting the writing rather than the genre. Saying that, I’m always being asked to make my typography ‘more literary’. I don’t know what that means! Can you think of a recent cover by another designer that you particularly admired, or that you wished you had worked on? SM: The Rosie Project [designed by Lee Motley of Penguin]. It’s one of those covers that you see every so often that is just slightly different from anything you’ve seen before. It’s nothing radical or particularly unusual – just a hand drawn title and a lobster – but it’s quirky and intriguing, very simple but strangely beautiful. SE: Actually, I really like Steve’s latest cover for Anthony Horowitz. You can cut it up and turn it into a rocket! What more could you ask for!? You’d have to buy two copies, though. And I couldn’t cut up a book jacket. In the case of The Maker of Swans, Orion indulged me by allowing me to provide an additional design brief, which was basically four pages of handwaving by an over-invested back seat designer. Do you dread when authors do that? Is it ever useful? SM: In this case, it was very useful to get more detail about the book from you, and to hear your ideas and vision for the cover. It gave Sinem and me more to work with, and certainly helped us develop our ideas. When an author has spent so much time creating a book, they are obviously going to have an opinion on the cover, so it’s important to listen to their ideas. But it can be difficult when an author has a very specific vision of their characters and plot, and gets very concerned with specific details [of design] that don’t always help to make a successful cover. SE: [Laughs] I normally do dread that, yes! But honestly, your case was different – it was exactly what we needed for inspiration. Sometimes when you get a brief, you’re left feeling like you need to know more. Especially with fiction, it’s so important to read the manuscript (even if it’s just a few chapters) to be able to create something unique, with that added layer. Your brief really made it clear just how interesting the book is. I ignored your design suggestions, but took from it the themes and [a sense of] what was unique about your book. We’ve spoken privately about how much I love the design you came up with, and I’m glad you ignored my amateurish suggestions. The result is utterly – and quite rightly – different to anything I had envisaged. The composition is starkly symmetrical, but also extraordinarily graceful. It has a wonderful visual economy too, and manages to encapsulate a great deal thematically that I think readers will appreciate once they’ve read the book. Was it a design that came easily, or did it go through many iterations? SM: I knew that Sinem’s elegant and hand-crafted style of illustration would be perfect. I suggested a swan’s neck as a starting point, and Sinem did about six rough versions. The one I thought was really interesting had the title made out of swan feathers. We tried to develop that idea but it just wasn’t working; it wasn’t swan-like or legible enough. We went back to my initial idea of a swan’s neck, and the concept of reflection and duality in the brief led us to two interlocking swans, like a playing card. I tried to make the cover work either way up – with the title appearing twice, so it could be viewed upside down. But it was too complicated and spoiled the simplicity of the design. The process of design often involves trying out over-complicated and unnecessary ideas, before scrapping them and going back to something much more simple. Sinem and I sat down and discussed ideas and scribbled rough sketches together, which is much more productive and creative than the usual process of emailing JPEGs back and forth. SE: Sometimes to produce something so simple, you have to go through a complex process and keep eliminating the unnecessary detail. Before you sent over your text, Steve had done a preliminary sketch, and asked me to illustrate a very graceful swan. It looked good, but a bit one-dimensional. It needed a twist. I then made about six rough mock-ups, which were either too obscure or too humorous. But after reading your inspiring brief, we had a chat and sketched out new ideas, scribbling over each other’s sketches. Towards the end of the day, I mentioned something about interlocking swans, like yin and yang — inspired by your themes of mirroring images — and Steve thought of an upside-down swan, and the idea just clicked! 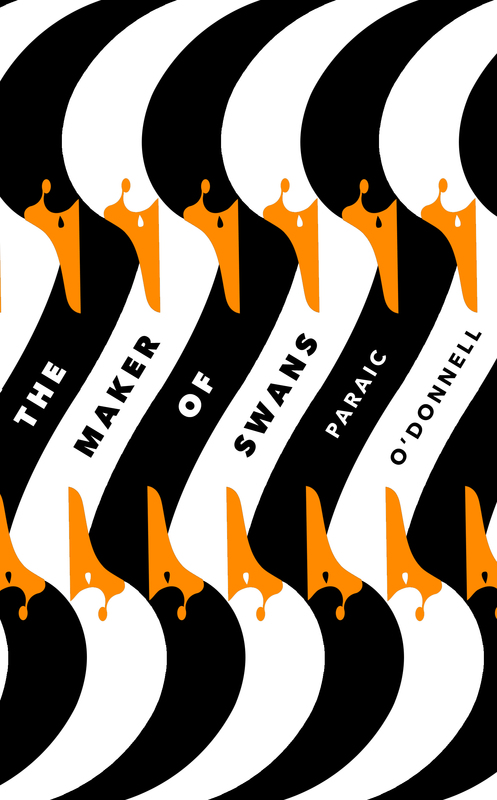 We knew it was going to work, and I developed the illustration of these interlocking swans to be as simple as possible and perfectly symmetrical. Steve’s art direction was brilliant, and he kept pushing me to make it more and more graceful. I added a handmade texture reminiscent of wood blocking or mono printing, which I think really adds a burst of energy to it. Another strength of this design is that it scales very well, and makes for an immediately recognisable thumbnail. How important a consideration are thumbnail images in the design process, given how much book buying now takes place not just online but on mobile devices? SM: It’s important to consider how a cover appears as a thumbnail on screen. It can feel disheartening to spend a long time designing something that is often so small when it’s viewed. Ultimately, though, I think the consideration to keep cover designs simple and eye-catching at small sizes has improved the design of covers generally. SE: Very! Throughout the design process, I’m constantly zooming in and out, and like to make sure my covers work well very small. My style tends to be quite minimalistic, so this works well. One last question. When you walk into a bookshop, is it difficult for you to suppress your critical instincts as designers, and to respond to the covers you see as a reader and a book buyer? SM: Yes! I look at book covers as a piece of design, and am instinctively drawn to designs that appeal to me, whether or not the book itself interests me. Looking in bookshops is very inspiring. I’m always seeing things and thinking, I wish I’d done that! SE: Totally! My bookshelves have to look good! I always find it upsetting when a brilliant story isn’t represented as it should be on the outside. Equally, I have been tricked many times into buying books — and music — with great covers that aren’t great. I have a lot of books I haven’t finished reading. I should listen to Bo Diddley’s advice [in ‘You Can’t Judge a Book By the Cover’], but I can’t. 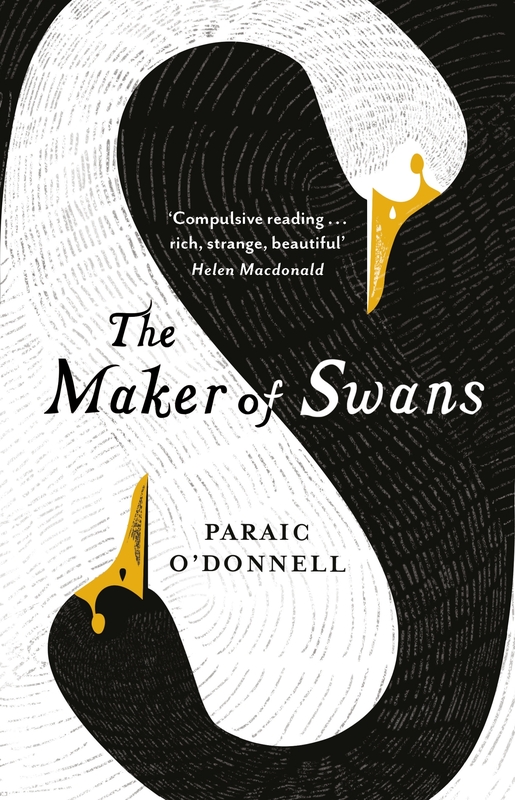 * * *The Maker of Swans will be published by W&N in February 2016.